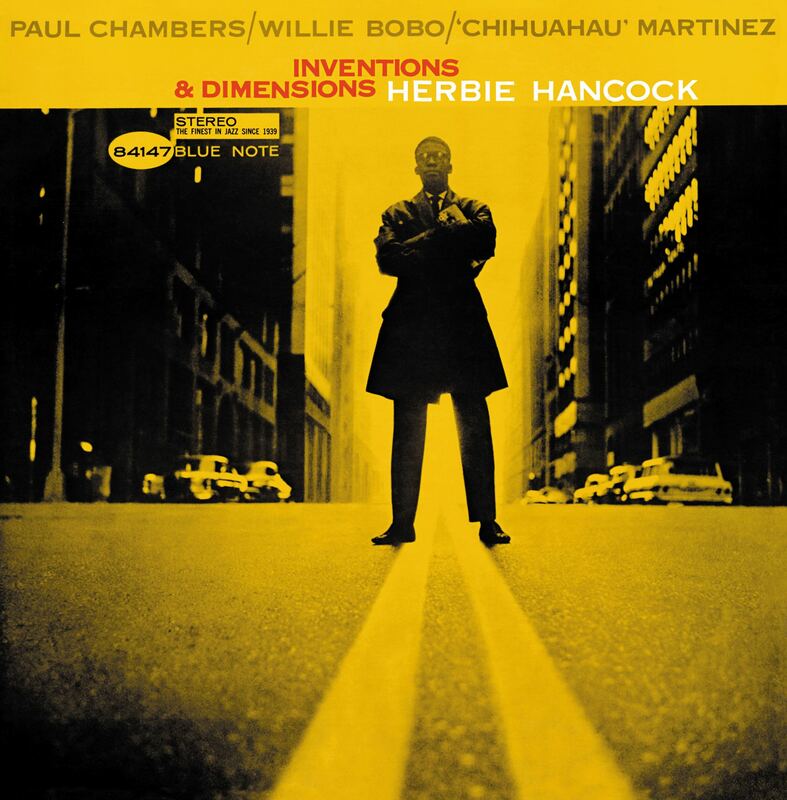 “For his third album, Inventions and Dimensions, Herbie Hancock changed course dramatically. Instead of recording another multifaceted album like My Point of View, he explored a Latin-inflected variation of post-bop with a small quartet. Hancock is the main harmonic focus of the music — his three colleagues are bassist Paul Chambers, drummer Willie Bobo, and percussionist Osvaldo “Chihuahua” Martinez, who plays conga and bongo. It is true that the music is rhythm-intensive, but that doesn’t mean it’s dance music. This is the most unusual recording Herbie Hancock has yet made, and it is certain to alter his “image” among jazz listeners. Hancock, born in Chicago on April 12, 1940, has served a varied apprenticeship with, among others, Donald Byrd, Phil Woods, Oliver Nelson, and since May 1963, as the pianist in Miles Davis’s Unit. On the basis of his work in the clubs and on his two previous Blue Note albums (Takin’ Off and My Point of View), Hancock has achieved a growing reputation as a modernist of taste, lucidity, and a crisp sense of swing. Until now, however, he has not been closely identified with the jazz avant-garde – those musicians who are working in various ways toward greater spontaneity and “freedom” in their music. The genesis of “Succotash” came from Hancock’s desire to work in 6/8. “I didn’t tell Paul what chords to use,” he adds, “because I didn’t know what they were to be myself. All he and the musicians knew was the time signature. The melody and the form of the piece developed spontaneously. The title occurred to me because at the very beginning, Willie Bobo’s brushes seemed to be making sounds like ‘succotash, succotash.” The scraping sound in the percussion section on “Succotash” is Osvaldo “Chihuahua” Martinez on guiro, a gourd-like instrument. “It was quite an experience,” Hancock recalls, “and a very enjoyable one. It was certainly full of surprises. One thing I did tell all the guys was to listen – listen to everything that was happening. And they came through.” This was the first time Hancock had worked with Paul Chambers, who had been recommended for the session by his former employer – and Hancock’s present leader – Miles Davis, “He is one hell of a bass player – and listener” says Hancock. Willie Bobo is a vital figure at most New York Latin and Afro-Cuban recording sessions. “What surprised me about Willie,” says Hancock, “is that he sounded as if he belonged in both the jazz and the Latin idioms.” Martinez, a longtime colleague of Bobo, impressed Hancock “by the beautiful job he did of keeping the pulsation going.” It was also Miles Davis, incidentally, who suggested that Hancock use two Latin percussionists in this series of explorations. Herbie went to Englewood Cliffs to record another Blue Note album. Instead of the typical Blue Note dates he was creating, Herbie sought to do something different, something that reflected what he felt about his playing at the time. Since he had been on the road steadily since May, he may not have had enough time to write complex new material. His associations with more open musicians may have planted the seed of adventure, but the confidence of being Miles Davis’s pianist had a lot to do with Herbie’s next album. The alternate take of “Mimosa” was chosen because of the attitude of the piano solo. Herbie takes his time and let’s his feelings go. The length may have reduced this take’s chance of being released, but it demonstrates quite clearly the freedom that Herbie was experimenting with and the confidence in the way he does it. On most of this album (deleted from the catalog soon after it was released), Herbie goes for the abstract, a radical departure from the safety of hard bop. Inventions And Dimensions (BN-4147) was a sought after item for years, until Blue Note reissued it, newly titled Succotash (BN-LA 152) and featuring a new cover, in 1972 to capitalize on Herbie’s new-found fame. The original cover, with Herbie in a secret agent-type overcoat, is a classic. Back on the road with Miles, a stop at the Monterey Jazz Festival in September was memorable (as well as recorded). A week at the Jazz Workshop in San Francisco and then a stop in Los Angeles. While in LA, Miles entered the Hollywood Studios on October 10 and 11 to record music for a play called “In The Time of the Barracudas.” The music was arranged and conducted by Gil Evans, which meant that there wasn’t much in the way of piano parts. Herbie plays only on the overture, and his solo is foretelling of his work a few years later, although you can hear the sound of Inventions And Dimensions in his voicings. The band finished the fall season by playing the Showboat in Philadelphia, the Jazz Workshop in Boston and three weeks at the Village Vanguard in Greenwich Village. The first of these Rollins-Hancock encounters took place on January 15, 1964, with Thad Jones on cornet, Sonny, Herbie, Bob Cranshaw on bass and Elvin Jones on drums. Nothing from this session was ever issued. On January 18, Sonny reassembled the group with Herbie returning and Ron Carter now on bass and Roy McCurdy on drums. They recorded such chestnuts as “52nd Street Theme,” “Four” and “Afternoon in Paris.” On January 24, the same musicians returned to the RCA studios to record more music. The take of “Django” from this session is magnificent, with Sonny imitating a gypsy guitar vibrato, and Herbie digging into deep swing. Strangely enough, this was the first time Herbie and Ron worked together as sidemen on a jazz recording session. If there was an event that defined a moment for a group of musicians, it would be something like the Miles Davis Quintet’s performance at Philharmonic Hall on February 12, 1964. Columbia Records recorded the event, and when My Funny Valentine (Columbia CL-2183) was released, Herbie, Ron and Tony became the jazz rhythm section. What they had been developing for the last nine months was coming to fruition, and this evening set the world on fire. Two days later, on February 14, 1964, Herbie met up with Sonny Rollins in the studio (with Ron Carter and Roy McCurdy) to record more standards for RCA. “Round Midnight” stands out from this session. The very next day, February 15, Herbie was in the studio for Blue Note, recording on Lee Morgan’s Search For The New Land (BN-4169). Joining Lee and Herbie for this session were Wayne Shorter and Reggie Workman (who five days earlier, on February 10, had recorded the classic Free For All (BN-417O) with Art Blakey’s Jazz Messengers). Grant Green and Billy Higgins rounded out Lee’s team. Search For The New Land finds Herbie in his Blue Note style. While the Miles Davis Quintet worked around town (at the Vanguard) the members of the group were busy during the day in the studios. Herbie and Ron began to be booked as a team for jingle sessions and television dates. For three days in May 1964 (the 25th, 26th and 27th) Herbie and Ron were in the Columbia studios recording an album called Bob Brookmeyer and Friends (Columbia CL-2237). The band included Stan Getz and Elvin Jones, with a young Gary Burton joining in on a few cuts. “Who Cares” and “Wrinkle” contain choice Herbie solos. On the 26th, Tony Bennett walked into the studio and the next thing you know, he’s recording with the rhythm section. A few of those tracks were released on Tony Bennett Jazz (Columbia KC-3177). A few weeks later, on June 3, 1964, Herbie was in the studio recording with Stanley Turrentine (In Memory Of, BN-LT-1037). Eight days passed (June 11), and Herbie was back with Sonny Rollins at RCA studios. Sonny had hired Jim Hall on guitar and Stu Martin on drums. The one usable track recorded was “Travlin’ Light” which is very unique. All of this activity would build up to a creative momentum that was beginning to blossom. As he worked with these different musicians, Herbie opened up his imagination. What his music lacked up to this point was unity, a central spirit to each composition. his next endeavor for Blue Note as a leader was to be a turning point in Herbie’s musical career. I’m always somewhat taken aback when I return to Inventions & Dimensions and note that Nat Hentoff introduces the album as Herbie Hancock’s plunge into “the jazz avant-garde.” Certainly there is nothing in this music as cataclysmic as the kinetic sounds of the Cecil Taylor unit that were documented at Copenhagen’s Montmartre Club the previous fall, or in the initial recorded work (staid accompanists notwithstanding) of Albert Ayler. For that matter, the boundary-stretching playing of Hancock, Ron Carter, and Tony Williams behind Miles Davis at the Antibes Jazz Festival a month earlier, heard on the recording Miles in Europe, can be said to have more of an avant edge than the present music. From a structural perspective, however, much of the music here, in its total elimination of harmonic and melodic information, could be considered more “open” than Taylor’s structures, or even Ornette Coleman’s epic Free Jazz. The results sound far more “inside,” which may tell us more about Hancock’s employer of the time than about Hancock himself. Hentoff points out that the pianist sought Miles Davis’s advice on personnel for the date, and that Davis is even an uncredited co-composer of the track “Mimosa.” This manner of collaboration between Davis and one of his pianists recalls nothing so much as Kind of Blue, but Where Bill Evans’s input on that seminal statement in modal jazz gave the music a more unprecedented aura, the suggestions by Davis reported in the original liner notes helped ground Inventions & Dimensions in the post-bop here-and-now. Surely Paul Chambers, as talented as he was, was not about to deviate as far from the norms of bass accompaniment as Ron Carter might, and the presence of two percussionists from the World of Afro-Latin music ensured a more symmetrical rhythmic bottom than Tony Williams would have been expected to provide. Hancock was free to take harmonic and melodic chances in the present environment, yet Davis’s suggestions (which in a sense presage the strategies employed in the trumpeter’s own electric ventures a few years later) kept Hancock focused in the areas of tempo and beat that Taylor, Ayler, and others were already placing under attack. What results is avant-garde jazz that an Ahmad Jamal fan can love. If hindsight contributes to our sense that Inventions & Dimensions is somewhat conservative in its approach, it does not in any way diminish the excellence of the results. Hancock took pains to ensure variety in his designs for each track, and in the way he surrounded the piano. On the latter point, it is worth noting that with the exception of “A Jump Ahead” and the outer sections of “Triangle” where Osvaldo “Chihuahua” Martinez lays out, no two tracks feature the identical instrumentation. The leader’s contributions are uniformly excellent, with an incredible variety of colors and textures as Hancock inserts parallel octaves, contrary motion, montuno vamps, and vivid chordal voicings amidst his brilliant single-note lines. The album is programmed in the sequence in which it was recorded, with the lone alternate take (recorded prior to the master) no doubt passed over for reasons of length. The unacknowledged hero of the Session is Willie Bobo, a celebrated giant in Afro-Latin music circles who rarely gets his props as a jazz percussionist. Born William Correa, a name by which he is also often cited in discographies, Bobo (1934-83) had earned notice in the jazz world for his work on the trap set With Cal Tjader and Herbie Mann prior to his first Blue Note date, Grant Green’s The Latin Bit, in 1962. The label then employed him as a drummer behind saxophonists Don Wilkerson, Dexter Gordon, Ike Quebec, and Charlie Rouse before the present session. Bobo’s versatility on timbales and conga drums, not to mention a couple of popular albums under his own name, kept him on the Latino side of the music scene for much of his career. His work here confirms that he had the straight-ahead end of the rhythm spectrum covered as well. Originally recorded on August 30, 1963 by Rudy Van Gelder at the Van Gelder Studio, Englewood Cliffs, New Jersey. Tracks #1-5 originally issued in 1964 as BST 84147. Track #6 originally issued in 1997 on CD B2-52434.